Particularly for the sophisticated applications in the industry, large residential buildings or heating plants, the ULTRAHEAT®-family was extended by the nominal flow size of qp 150. The redesigned ULTRAHEAT qp 150 works with the high-precision and proven ultrasonic technology and can flexible be used as a heating, cooling or flow meter. The special feature is the exchangeable measurement insert, which significantly simplifies maintenance and re-calibration and reduces life-cycle costs simultaneously. The flanged body remains permanently in the system – without any influence on the measuring accuracy and stability. This distinguishes the new ULTRAHEAT from similar measuring devices. The calibrated measuring unit consists of the measuring channel, the sealing plate with the proven ultrasonic transducers and the adjusted electronic of the T150 (2WR7…). The flanged body itself has no influence on the measuring accuracy or stability and remains permanently in the system. For re-calibration only the lightweight measurement insert needs to be exchanged. This can easily be done by one person and without any special tooling, reducing life-cycle-costs tremendously. 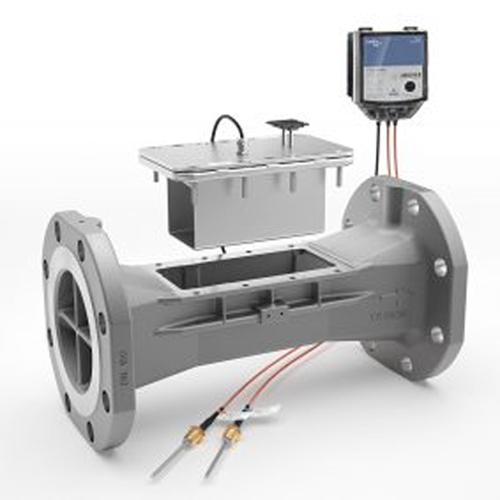 The flow part and the measurement insert consist of high-quality stainless steel and are IP68 approved. The electronic unit with a maximum cable length of 5 m can be mounted separately. This allows operation even under harsh environmental conditions. The functionality of the electronic unit is identical with those of the T150 (2WR7…). It requires no new products in terms of service and communication.